Veterans of the 63rd Infantry Division meet in the "48 Club"
Cpl Robert Conn of Hq 63rd Div Artillery. L-R- Back Row: T/5 John T. Janulis, Pfc George Goldberg, Cpl Richard Bame(F/253d Inf). 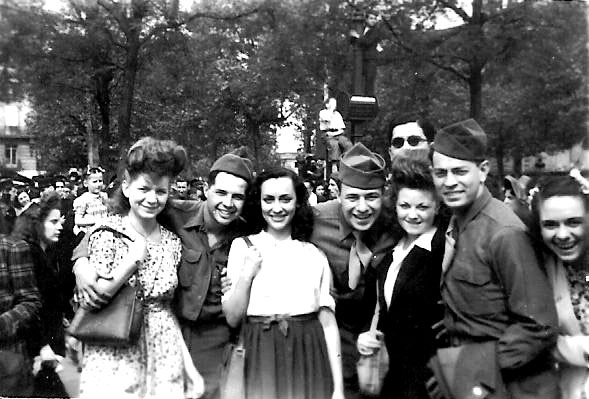 Pfc George Goldberg in Berlin - October 1945, as part of the Soldier Show "Carmen"
Headquarters 253d Infantry Regiment , unless otherwise indicated, prior to joining the Tour. The Carmen Soldier Show photographs were furnished by Teddy Goldberg ,widow of Pfc George Goldberg.